Given the recent rescue of a climber on Mt. Hood by a Chinook, how are the pilots able to lower the tail in this situation? Is this just the natural angle during a hover, or are there some adjustments the pilots can make to the fore and aft collective individually? A careful balance of nose-up cyclic and decreased collective to stick the aft of the ship firmly in place. Not so much a landing, as flying with the aft gear and ramp planted. 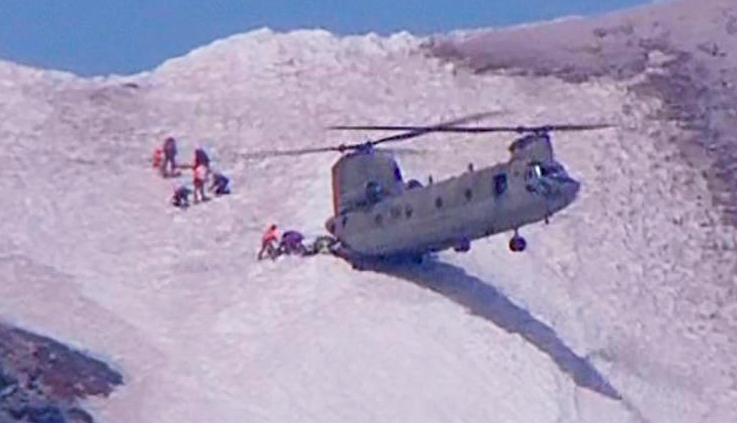 Because the helo is barely hovering in level flight with the aft landing gear resting on the inclined snow pack. It doesn’t lower its tail as such. Not the answer you're looking for? Browse other questions tagged helicopter pilot-technique ch-47 or ask your own question. How do you check for soft or muddy ground on a backcountry landing? Do pilots land a helicopter sideways for improved visibility of the landing area? Stick in center console, how to easily write down clearances and other similar information?